JB coeditor of Take Five - Best contemporary tanka, volume 4, 2011 along with tanka colleagues Patricia Prime (N.-Z. ), Magdalena Dale (Romania), Amelia Fielden (AUS/JP), Claire Everett (UK), Owen Bullock (N.-Z. ), David Terelinck (AUS) and David Rice (U.S.). Anthology directed by M. Kei (U.S.). Task: The editorial team read, nominated and selected tanka published in English, in 2011, around the world… which amounts to nearly 18 000 tanka. Only 380 of them have made it in the anthology among them one finds many poets from English and French Canada. The anthology was published in May 2012. This bilingual collection, a suite in seven movements containing 91 poems, deals with themes dear to tanka – a Japanese poem of 31 syllables (5-7-5-7-7) arranged, in the West, on five lines: love, family, friendship, travel, aging, loneliness, the beyond. The parallels between the cycles of Nature and life are constant. With sensitivity, tenderness and sincerity, Janick shares a Life’s journey similar to that of many contemporary women. of souls and wings is introduced with a HERstory of tanka since the 9th century. Ten poetesses and two women translators are honoured: in ancient Japan, from the era of Heian-kyō (794-1185): Ono no Komachi, Michitsuna’s Mother, Sei Shōnagon, Murasaki Shikibu, and Izumi Shikibu; and from the era of Kamakura (1185-1335): Abutsu-ni. From 20th c.: Yosano Akiko from Japan; Judith Gautier and Kikou Yamata, two translators from France. Then, the first French-language tanka poetess, Jehanne Grandjean (1880-1982). Finally, two contemporary poetesses from Japan, Tawara Machi and Mayu. To order, please click on the « Order form » section of this Web site. To read what the « English Media » have to say about this collection, point the cursor to the top of the page then, click. As of November 2012, Janick recovered 100% of her copyright for this bilingual collection. A copy of this book may be found in The British Library, London; Section of Western European Languages Acquisitions, South Floor 2. Bilingual feature article published in the US tanka journal, Atlas Poetica in its issue 17, Spring 2014: an overview of tanka in French. This article, in six sections, deals with a few literary personalities who, since 1871, translated, wrote or published tanka in French. For clarity, the historical overview approximates chronology. Writers and poets are presented in terms of their noteworthy accomplishments in the realm of Japanese-inspired poetry, and I on occasion provide my own impressions of their work. Also cited are tanka I find especially resonant. I conclude with an eye to the future. To read it en français, please go to the French side of this web site, click on «Tanka» then look for «Articles» published in the Revue du tanka francophone, juin 2014. J.B. edited and introduced a Special Feature on the on-line contemporary tanka journal from the US, Atlas Poetica. 25 poets from 9 different countries were selected to be part of this collective work on the theme of LGBT. The feature includes Biographical Sketches of the poets. 1st article is related to Judith Gautier and Kikou Yamata’s lifes as women writers. They both translated tanka books from Japan. 2nd article is a review of Kikou Yamata’s book «Sur des lèvres japonaises» («On Japanese Lips» in English). The review is about tanka poets translated by Kikou – among them, Ki no Tsurayuki, Lady Ise, Izumi Shikibu, Akiko Yosano. 3rd article is a comparative study of the translations of «Genji monogatari» (The Tales of Genji); one by Kikou Yamata (1928) and the other by Rene Sieffert (1988). The study concentrates on the nine first chapters (out of 54) of the masterpiece written in the Xth c. by Lady Murasaki Shikibu, the first novel ever written in the world. 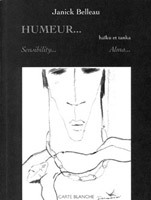 Regular contributor to the only literary paper magazine dedicated to Tanka in French (ancestor of Haiku). Articles focus on some of the greatest Japanese poetesses of the Heian period (794-1185) such as Ono no Komachi and Shikibu Murasaki; and on some of the best XXth century poetesses such as YOSANO Akiko and TAWARA Machi. To read an article about Ono no Komachi by JB, please click Revue du tanka francophone ; then, go to Numero 1. Informal talk to members of the Nihon Kajin Club (the Japan Tanka Poets' Society) in Tokyo. Before the talk, there was a visit to some temples and sanctuaries in the Meguro area followed by an intimate luncheon.